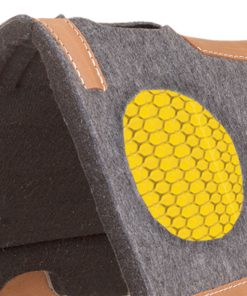 This pad is solid wool felt with a fleece bottom. Wool felt is a top choice of pad materials because of the natural shock absorption, natural moisture absorber, breathes, and is quick drying. 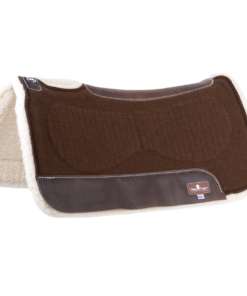 The fleece bottom provides plush comfort against the horse. Circle Y uses heavy oiled grainout wear leathers for less cracking and drying out. 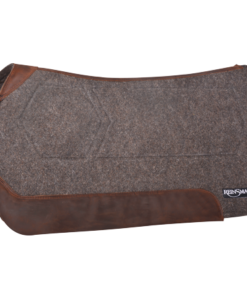 This wool saddle pad has a futurity front for wither relief and contoured for a great fit to the horse. Wool provides excellent shock protection. It will naturally wick away more moisture, release heat build up, breathe for a cooler ride, and is quick drying after use. The wool conforms to the horse’s back resulting in less slippage. 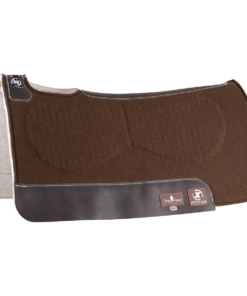 The contour shape provides better fit for horses with more pronounced withers or more sway to their back and allows the saddle to fit properly.